Hundreds of police have been ordered into an area of central Indonesia after three schoolgirls were beheaded and another badly injured by attackers. The teenagers were walking to their Christian school near the town of Poso, in Sulawesi province, when their unidentified assailants struck. Provincial and district officials have urged residents not to be provoked by the attack. The area has a long history of violence between Muslims and Christians. The girl who survived Saturday's attack is reported to be in a stable condition and has been moved from Poso to a police hospital in the provincial capital of Palu. She is reported to have told police that there were six machete-wielding attackers, who were dressed in black and wore masks. President Susilo Bambang Yudhoyono has condemned the attack as "sadistic and inhuman". Reports of the killings were featured across the front pages of many Indonesian newspapers on Sunday. Central Sulawesi and Poso in particular was the scene of bitter fighting between Muslims and Christians in 2001 and 2002. 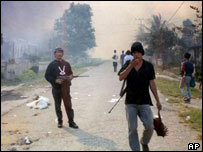 More than 1,000 people were killed before a government-brokered truce. Although the violence has been subdued, it has never gone away completely. A bomb in May in the nearby town of Tentena, which is predominantly Christian, killed 22 people and injured more than 30.